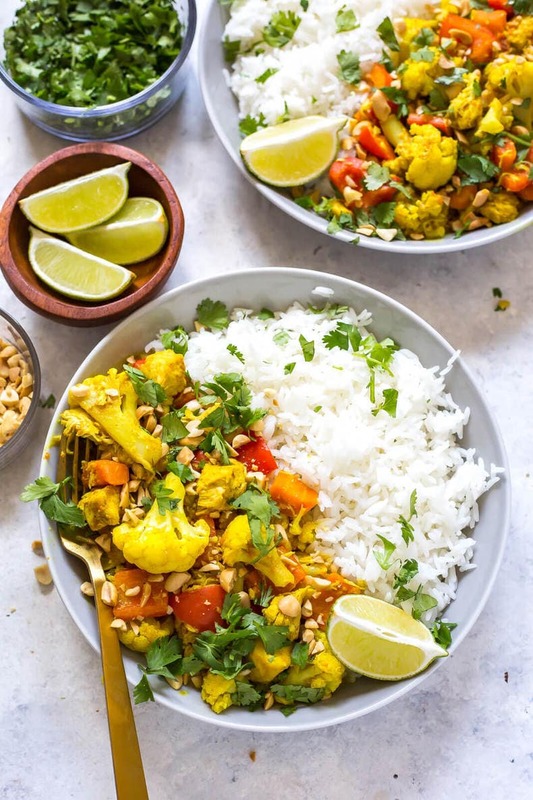 This Instant Pot Peanut Coconut Chicken Curry is a healthy, easy one pot dinner idea that's hearty, wholesome and perfect for chilly nights! Say hello to healthy comfort food! I don't know about you, but a big warm bowl full of chicken curry is right up my alley when it comes to fall comfort food. There's just something about a creamy curry that makes me want to curl up on the couch with a big blanket and huddle inside while it's chilly outside. And want to know a little secret to getting your curry even more rich and indulgent? 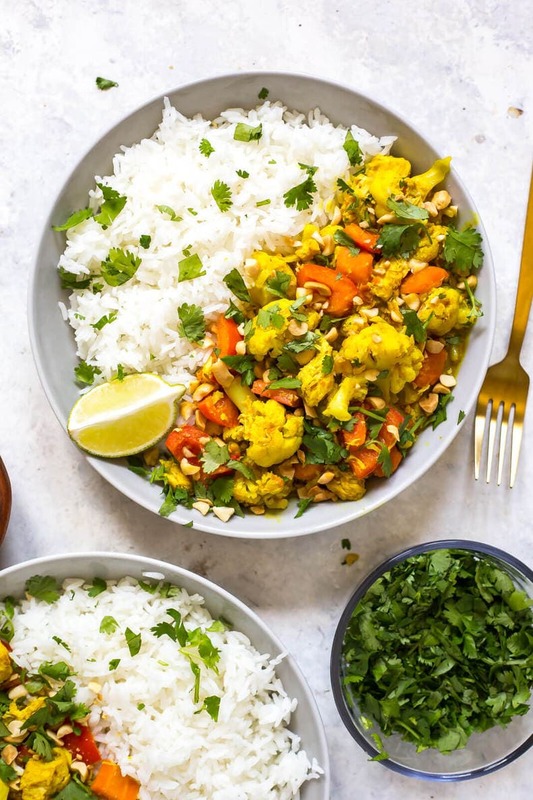 Yes, one of your fave snacks can now also be used in a coconut curry chicken dish such as this one! 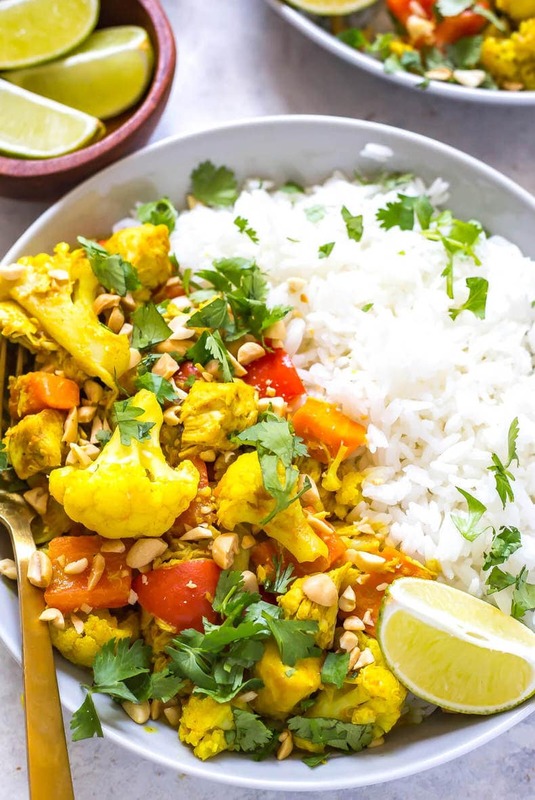 I've partnered with my friends at The Peanut Bureau of Canada to bring you this amazing veggie and protein-packed chicken curry, and let's just say it's just as perfect for meal prep as it is for a quick and easy weeknight dinner. The peanut butter undercuts the spice and it blends so beautifully to turn any curry into a savoury sauce that has a hint of nuttiness. I eat peanut butter almost everyday but it's usually in combination with something sweet like with sliced apples. I typically enjoy it as a snack but it's a fabulous cooking ingredient – just check out these Soba Noodle Jars and Peanut Chicken Meal Prep bowls as proof it always makes for a delicious sauce. You don't need a whole lot of ingredients to make this chicken curry dish – in fact, you can rely mostly on pantry staples for this recipe! 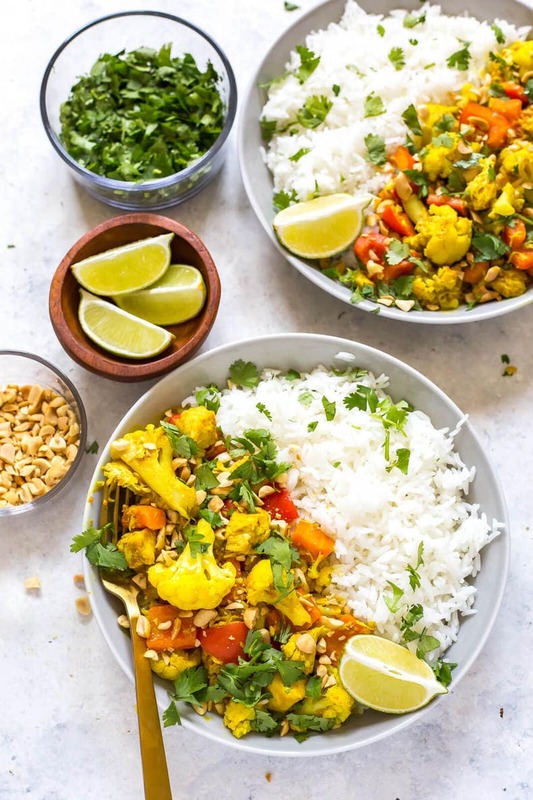 Everyone always has a jar of peanut butter in the kitchen, and as long as you keep a well-stocked spice drawer and have a few cans of coconut milk on hand, you can make a few other substitutions with the veggies to bring this curry together. You really only need cumin, turmeric and curry powder as the main spices in this chicken curry, and the coconut milk and peanut butter bring a rich, creamy taste to the sauce. I always have chicken breasts in the freezer so that I can whip up many different recipes in a flash, and I also always have rice in the cupboard as well. Really, it's just having the right veggies on hand for this recipe and you've got dinner ready in 30 minutes! 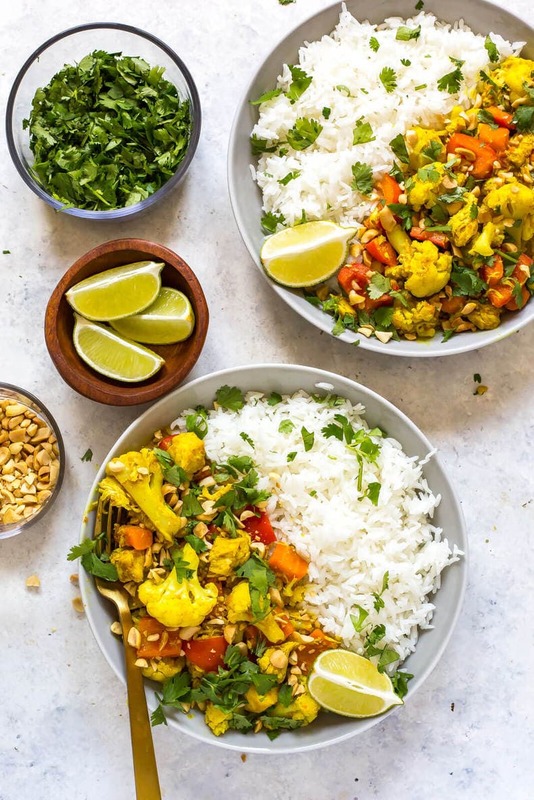 Though you don't always find peanut butter in curry recipes, it brings a subtle nutty flavour to the mix and a little bit of extra added protein. I also love adding chopped up salted peanuts as a garnish alongside the cilantro because they add a fun texture and some extra fibre as well! Did you know that peanuts are also packed with protein (9 g per serving) and contain more than any other nut? Surprisingly most of the fat is unsaturated as well, so you're getting in a well-rounded meal that is filled with nutrients and guaranteed to give you energy for the whole week if you're taking the leftovers to work. Speaking of leftovers, this curry reheats very well so it can totally be used as a meal prep recipe. 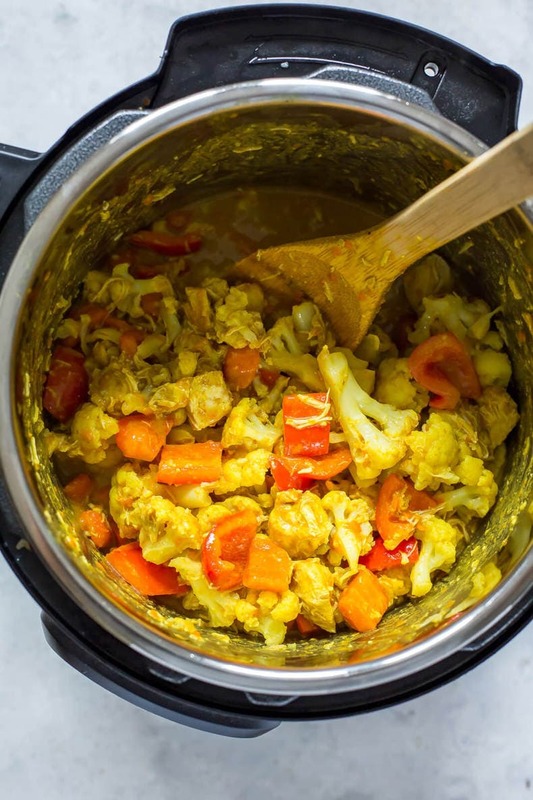 It's no secret that I love using my Instant Pot to make big batch meals for the work week, so you're looking at just about half an hour for this curry to come to fruition. It also cooks up in one pot so there's very little mess or hands on cooking time. Finally, you might notice that I have cooked everything twice on the high pressure setting, and that is to account for the cauliflower. You want the cauliflower to be tender, but not overcooked, so I'll usually cook the chicken, carrots and spices on high pressure for 3 minutes, then stir in the cauliflower and cook it on 0 minutes. Yes, you read that right! Zero minutes – I find it's a great way to bring everything back to pressure to just lightly zap the cauliflower and steam it without overcooking it, and it just takes a couple more minutes after you've initially cooked the chicken mixture since the pot is already pre-heated. Add some fresh cilantro or parsley, garnish with your crunchy peanuts and dinner is served! How easy is that?! Will you be making this Instant Pot Coconut Chicken Curry? It's such a great way to enjoy comfort food with a healthy twist! 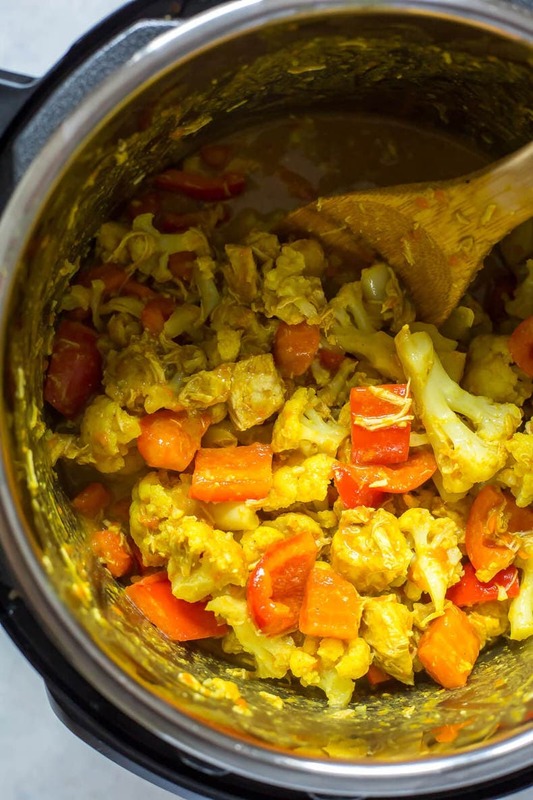 Add coconut oil, chicken, carrots, peanut butter, garlic, curry, turmeric, salt, cumin and coconut milk to Instant Pot in that order. Cook on high pressure 3 minutes and do a quick release of the pressure. Instant Pot will take about 15 min to preheat and the 3 min to pressure cook. 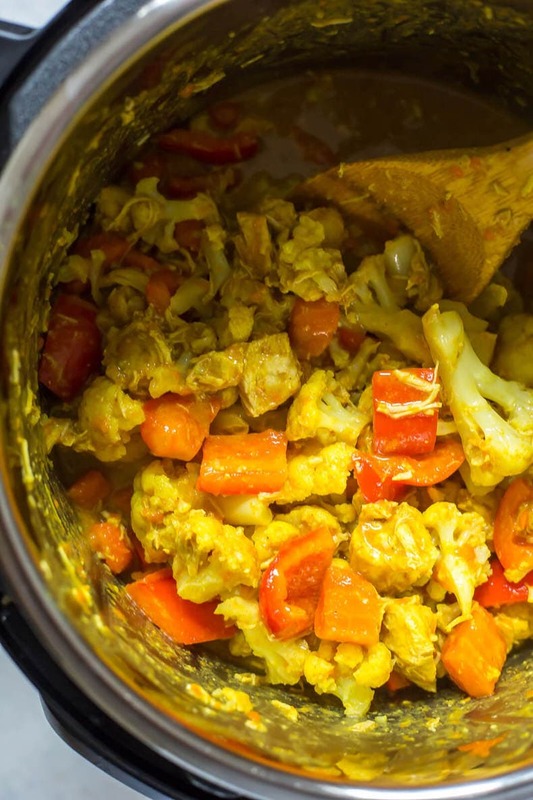 Add cauliflower, then cook on high pressure 0 min (yes, zero minutes! It basically just steams the cauliflower without overcooking it). Do a quick release of pressure (there shouldn't be much), then open lid when safe and stir in red pepper. 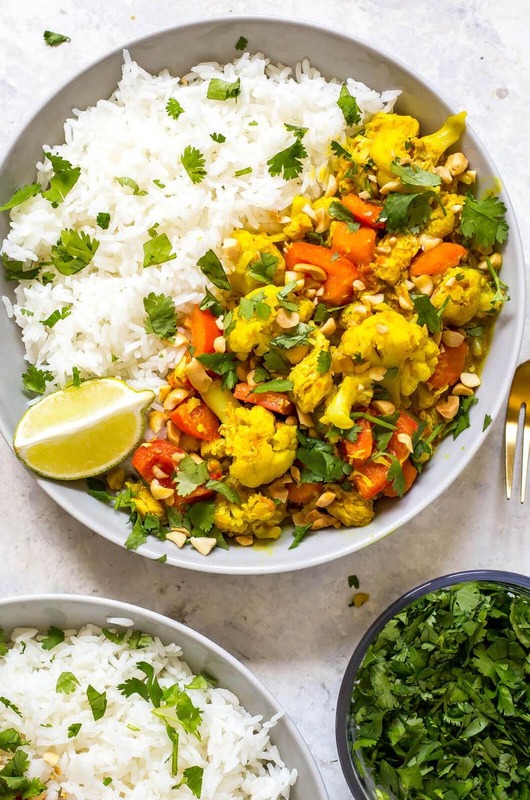 Top with peanuts and cilantro and serve alongside a bed of basmati or jasmine rice. Enjoy! Sorry about that Vero – I’ve fixed it now! Hey Kayla – I usually use unsweetened (http://www.thaikitchencanada.ca/products/coconut-milk/coconut-milk-400-ml) I haven’t tried it with sweetened I don’t think! I don’t have an instant pot. Can I make this in a regular pot on the stove? Would I have to change anything ? Hey Nadine – I’m sure you could make this on the stove! I can’t give exact alternate directions because I haven’t tried it myself but I imagine it would be as simple as just sauteeing the chicken with spices, onions, etc and then adding in cauliflower/coconut milk and bringing to a boil then letting it all simmer. Let me know if you try it! Can I use Silk coconut milk unsweetened? Thanks! Honestly I wouldn’t! That kind is made more for drinking than it is cooking. I’m glad I asked! Thank you! I just made this and its so good!!! I sprinkled a little bit of garam masala on top for a little extra flavor and its incredible! The cooking for 0 minutes works PERFECTLY for the cauliflower! Thank you so much for sharing!! 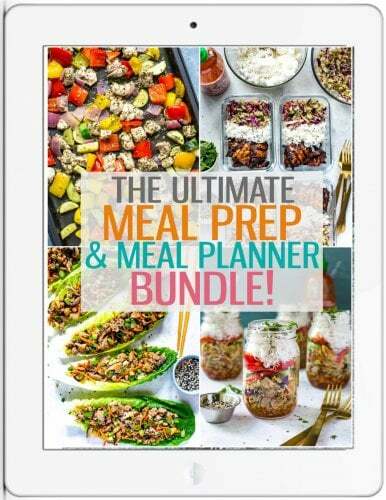 I get bored easily when eating “healthy” so I am always looking for flavorful recipes to keep my taste buds satisfied. 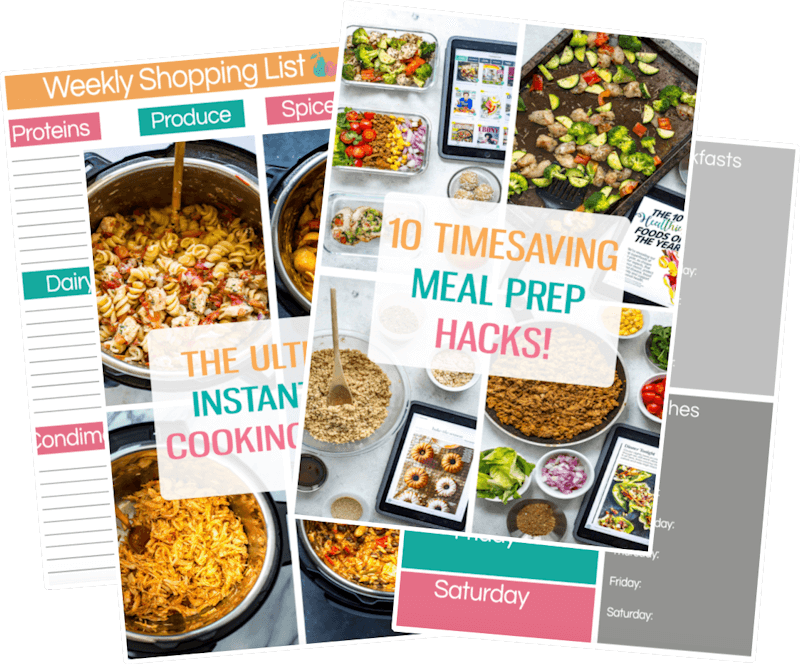 Can’t wait to try more of your recipes! I was so surprised that 0 minutes works but it’s great for veggies like cauliflower and broccoli! Perfect way to steam veggies 🙂 So glad you liked it Rebecca! I am hoping to make this, this week. Is the chicken added raw, or should the chicken be cooked first and then added to the pot? Hey Lauren – the chicken is raw! It will get cooked when you turn the Instant Pot on and cook on high pressure.